Want to discover how an expert handles mail scammers? We have a hilarious Treat for you. Have you ever received one of those highly suspicious emails? Such as the ones about unclaimed insurance bonds, diamond-encrusted safe deposit boxes, close friends marooned in a foreign country. They constantly pop up in our inboxes, and standard cybersecurity procedure is to delete on sight. But what happens when you reply? The following video is from TEDTalks. If you are not familiar, TEDTalks is a daily video podcast of the best talks and performances from the TED Conference, where the world's leading thinkers and doers give the talk of their lives in 18 minutes. 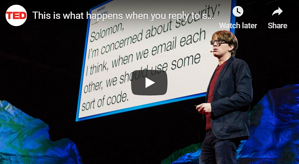 Follow along as writer and comedian James Veitch narrates a hilarious, months-long exchange with a spammer who offered to cut him in on a hot deal. TRICK or TREAT!! Enjoy and learn. Want to learn more? Then find out what could happen to you if your personal data falls into the wrong hands. Our article on cyber privacy might surprise you. !